In some ways, St. Joseph is a forgotten saint. Not because we don’t know who he is, but because we don’t know a whole lot about him. He doesn’t say one word in the Holy Bible, his actions speak for him, and he disappears entirely after the finding of Jesus in the Temple. During his lifetime, his influence and guidance occur mainly behind the scenes. Despite all this, he is a model of faith, obedience, loyalty, and charity, as well as a great source of strength and support in all our needs. He is invoked by workers, by and for the dying, for the Church, and for families in his capacity as patron saint. He is a role model for men in general and for fathers in particular, especially homeschooling fathers. Although more and more fathers are taking an increasingly active and hands-on role in the education of their children, they can sometimes seem to be, or to feel, pushed to one side or forgotten in the day-to-day business of homeschooling. Circumstances may dictate that their presence be relegated to the hours after they return home from work and to weekends, while Mom or Grandma, or whomever the primary teacher is, takes center stage the rest of the time. But Dad’s importance cannot be overstated – even while it might be of a different type. St. Joseph is not heard in the Bible, but we are told that he was a carpenter, or perhaps more accurately a stonemason or someone who works with his hands. In any event it is certain that he would have taught Jesus his trade. 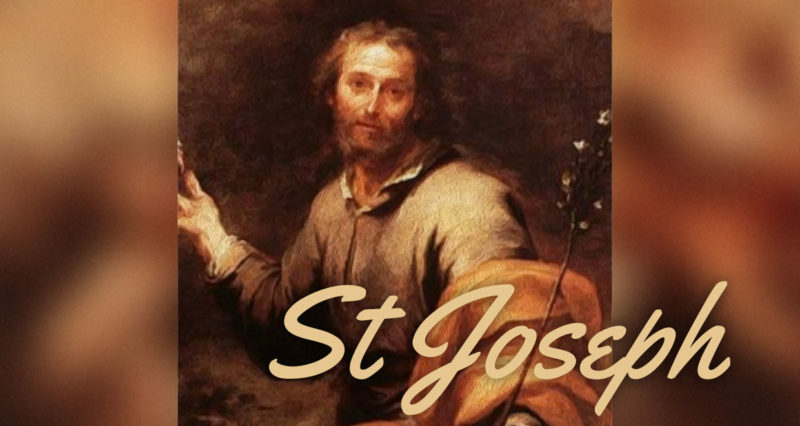 We are also told that St. Joseph was an upright and obedient man who loved and protected his family no matter what the personal cost might be. Even though Jesus is the Son of God, St. Joseph modeled for Him how a man should behave in any given situation. Mary and Jesus depended on him and St. Joseph did not let them down. He was always there for them. Homeschooling fathers have the same responsibility to their families. At the risk of sounding reactionary or corny, while Mom is the heart of the family, Dad is the head. His support is vital if homeschooling is to succeed. If Dad’s at work all day, how can he help with homeschooling? Show support for the decision to homeschool. In our family, when we first started, my husband’s job didn’t allow him to get overly involved in the day to day homeschooling of our girls, but he always showed his interest and support by attending daily Mass with us if possible, asking about their day, and when applicable, by looking over some of the girls’ work work with them. Find ways to be involved. My husband was the ‘principal’ of our little school. The girls would give him daily reports, both good and bad. If something was extra good, or on those rare occasions, extra ‘bad’, they were allowed to call their father at work. On days when calling him was not possible, they would tell him as soon as he got home and had a moment to relax. Needless to say, they loved telling him the good, but they hated having to tell him when they did something wrong. Even though he was not at home during the day, he became a deterrent to naughty behavior. He was present in spirit. When possible show an interest in the children’s studies or be otherwise involved in their lives. Be available to answer questions. Read them a bedtime story. Take a walk together. Be part of a family game night. Teach them a skill. Model the behavior you would like to see them exhibit. This is important for both boys and girls, especially so that boys know how to treat girls, and so girls will know how they should be treated by boys. Let both teacher and students know how proud you are of them. Reward the primary teacher and students somehow when goals are met. Now that we have highlighted how important fathers are, maybe we should consider how we can show them how much we appreciate them, especially with Father’s Day just around the corner. Thank Dad for all he does for you and the rest of your family (for the roof over your head, for the food you eat, for bringing you up in the Faith, for letting you homeschool). Pray for him. Give him a spiritual bouquet of prayers, Rosaries, Masses, and Holy Hours or adoration visits. Have a Mass said for him. Learn a skill Dad enjoys and then do it with him. Make a coupon book of tasks and activities he can redeem that you will do with, or for, him. Don’t forget to wish him a very happy Father’s Day. Most gracious Heavenly Father, We thank you for our earthly fathers, those to whom you have entrusted the responsibility to provide loving protection of their families and guidance of their children. We thank you, also, for our priests and bishops, whose spiritual fatherhood is so vital to the faith of your people.